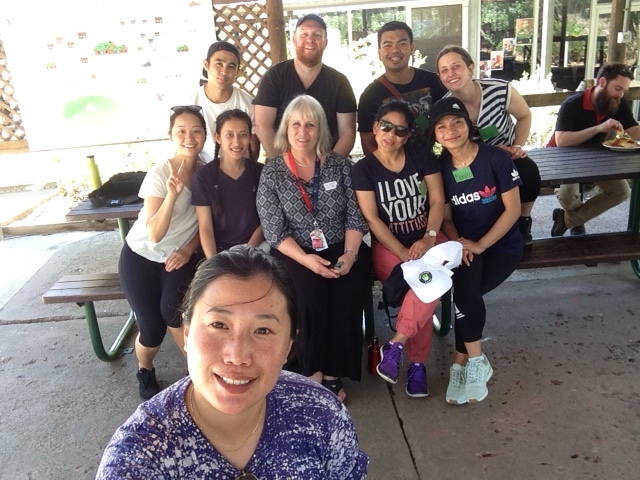 During the hot weather prior to Christmas, 24 students from 2nd year in the Bachelor of Nursing were the first from ACU to attend the Recovery Camp at YMCA Camp Yarramundi. From Monday morning until Friday evening these students lived at and participated in this recreational camp with a group of volunteer people with Lived Experience of Mental Health problems. Bushwalking, rock climbing, tai chi, crafts, archery, bush dancing, rope courses, damper making and further activities formed a framework for clinical workplace experience for these students, and a recovery-focussed experience for those living with an experience of mental illness. These activities draw upon principles of therapeutic recreation, that is the use of activities to as a therapeutic way to improve health and quality of life. This program is an evidence-based and innovative mental health clinical placement experience that originated from the University of Wollongong in 2013. It arose from a recognition that In Australia, over 30 universities require over 35,000 student nurses to attend 800 hours of clinical workplace experience for the completion of preregistration nursing courses. There exists a need for more clinical workplace experience opportunities, especially those that go beyond traditional clinical placement programs, and that meet curriculum requirements. The Recovery camp has achieved four national awards and two Vice-Chancellors Awards for research and community engagement. For health students, Recovery Camp has proven to result in statistically significant increases in clinical confidence and clinical competence. It has also been found to reduce stigma compared to comparison student cohorts who attend traditional clinical mental health placements (Cowley et al ,2016). For people with a mental illness, research indicates they experience an increased sense of control, enhanced confidence and decreases in leisure boredom (Moxham, Liersch-Sumskis, Taylor, Patterson, & Brighton. 2015). Feedback from our ACU nursing students echoed these research findings. Cowley, T., Moxham, L., Sumskis, S., Taylor, E., Patterson, C., Brighton, R., & Halcomb, E. (2016). Evaluation of undergraduate nursing students’ clinical confidence following a mental health recovery camp. International Journal of Mental Health Nursing, 25(1), 33-41. Moxham, L., Liersch-Sumskis, S., Taylor, E., Patterson, C., & Brighton, R. (2015). Preliminary outcomes of a pilot therapeutic recreation camp for people with a mental illness: Links to recovery. Therapeutic Recreation Journal, 49(1), 61-75.